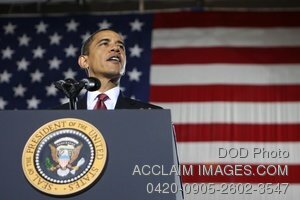 Description: Stock photo of United States President Barack Obama talking to service members and civilians at Camp Lejeune, N.C., Feb. 27, 2009. Obama visited Camp Lejuene to talk about current policies and his exit strategy for U.S. military personnel in Iraq. (U.S. Marine Corps photo by Lance Cpl. Michael J. Ayotte). Stock photography by Department of Defense Public Domain.